This article provides detail information on the permeability test of concrete. 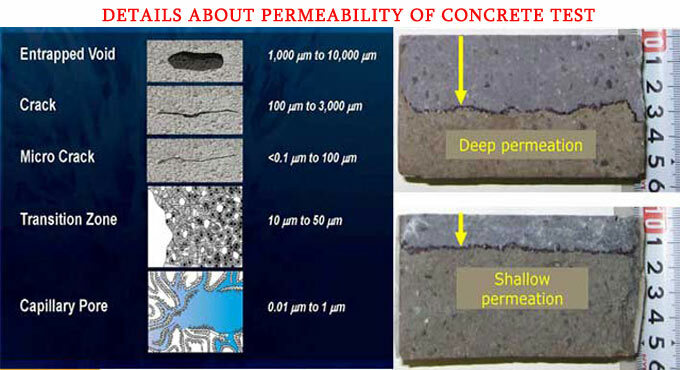 The concrete permeability and porosity is co-related. Porosity: Each material (sand, soil, cement, etc.) contains pores with voids in it. Porosity belongs to an elemental property of the material calculated with regard to the amount of void space as a percentage of total volume. It is usually exhibited as a percentage among 0% to 100%. Permeability of Concrete: Concrete is a composite material made of Cement, Sand & coarse aggregate. Each material contains pores with voids in it. Aggregates contain a more persistent void that varies from 1mm to 10mm which are filled with cement paste. Even cement contains voids which vary from 1micron to 10micron. Because of interrelated and continuous link to stuff one void by other material concrete is likely to seep into fluid or gases into it. Existence of voids in concrete creates porous which sequentially facilitates water or gas to penetrate into it. The permeability of concrete means the strength of concrete to safeguard against water penetration or entry of any other substance into it when the external force is employed. Importance of the Permeability of Concrete: Stability of concrete as well as complicated property of concrete is very crucial. If concrete is porous, various damaging materials like water, CO2, SO2 & Cl penetrate through the pores of the concrete and make reaction with the reinforcement to develop rust that raises the volume of the reinforcement and injures the structure. It is necessary to have clear understanding of the range and rate of permeation beforehand to design structure in an efficient manner. If the concrete is pervious and facilitates water to seep into it, the reinforcement in concrete is likely to be damaged with corrosion and develops rust (raises volume of reinforcement) which finally leads to cracking of surface and collapsing of the structure. 1. Water-Cement ratio: Too much water is added to the concrete mix to enhance the applicability of concrete. This supplementary mixing of water in excess of the necessary quantity raises the porosity in concrete and reduces the strength of concrete. To stop the penetration of water into the concrete 0.4 water-cement ratio is accepted. It is found that selecting a water-cement ratio of 0.4 transforms concrete impervious. 2. Improper compaction of concrete: Inappropriate compaction in concrete causes the major issue for porosity in concrete. Hand compaction method or machine compaction methods should be used to compact the concrete properly and sufficiently. Due to poor compaction, the honeycomb in concrete may be developed that ultimately leads to corrosion of steel and cracking in surface. 3. Inappropriate Curing: Concrete should be effectively cured to cope up with the atmospheric weather. Inappropriate curing in concrete results in developing cracks and consecutively, it enhances the permeability of concrete.